COOPERSTOWN, NY – Dave Van Horne, who has spent the last 42 seasons calling play-by-play action for the Montreal Expos and the Florida Marlins, has been selected as the 2011 recipient of the Ford C. Frick Award, presented annually by the National Baseball Hall of Fame and Museum for excellence in baseball broadcasting. Van Horne, who will be honored during Hall of Fame Weekend, July 22-25, is the first Expos broadcaster to win the Frick Award. He is the second Marlins broadcaster honored, joining Felo Ramirez, a Spanish-language broadcaster, and the second Frick Award winner to have called games for a Canadian team, following Tony Kubek, who broadcast games for the Blue Jays and was honored in 2009. "Dave Van Horne introduced Major League Baseball to English-speaking fans in Montreal, and his voice became the standard for two generations of Expos fans," said Hall of Fame President Jeff Idelson. "Since 2001, Dave has energized Marlins fans in South Florida with his infectious love for the game, his excitable play-by-play, and his signature 'Up, Up and Away' home run calls. 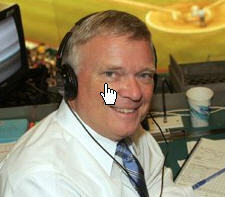 We are thrilled to announce Dave Van Horne as the 2011 Frick Award winner." Van Horne, a native of Easton, Pa., began his broadcasting career with the Richmond Braves of the International League, and was twice named the Virginia Sportscaster of the Year by the National Sportswriters and Sportscasters Association before joining the Expos for their inaugural season of 1969. He called Expos games on radio and television, describing such memorable moments as the Expos debut on April 8, 1969, Willie Mays' 3000th hit, Nolan Ryan's passing Walter Johnson on top of the career strikeout list and Steve Carlton striking out his 4,000th batter. Van Horne also called games for The Baseball Network on ABC and NBC. Van Horne joined the Marlins in 2001 as the club's lead radio voice. He broadcast the Marlins' 2003 World Championship season, adding to a resume that includes three World Series and National League Championship Series broadcasting assignments for Canadian networks. Van Horne also broadcast the last Expos game in Montreal, in 2004, as a member of the visiting Marlins radio broadcast team. Van Horne has shared the broadcast booth with partners such as Don Drysdale, Pee Wee Reese, Duke Snider, Ken Singleton, Buck Martinez, Tom Cheek and Tommy Hutton. He was the recipient of the 1996 Jack Graney Award, given by the Canadian Baseball Hall of Fame for contributions to the game through broadcasting. Van Horne will be honored as an award recipient during Hall of Fame Weekend 2011, July 22-25 in Cooperstown, N.Y, along with 2011 J.G. Taylor Spink Award winner Bill Conlin, who was announced on Tuesday. Pat Gillick, who was elected on Monday by the Expansion Era Committee, will be inducted on July 24, along with any electees who emerge from 2011 Baseball Writers' Association of America election, to be announced Jan. 5.